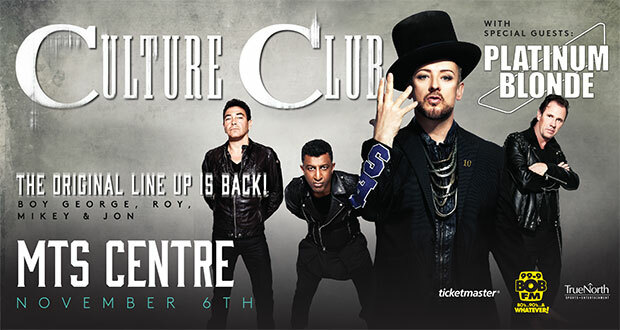 WINNIPEG, MB: Culture Club, one of the biggest pop-bands of the 80’s, are coming to MTS Centre with all their original members for one show on November 6, 2016. Tickets go on-sale Friday, September 16 at 10:00am through Ticketmaster. Ticket prices start at $39.50 (plus fees). Culture Club racked up seven straight Top 10 hits in the UK and nine Top 10 singles in the United States. Central to the band’s appeal was the flamboyant front man Boy George, whose cross-dressing and heavy make-up created an image which was completely unique on the pop scene. George was also noted for his biting wit and frequently came up with cutting quips that won Culture Club media exposure on both sides of the Atlantic. Although they drew influence from the ‘New Romantic’ movement, Culture Club was also inspired by the music and fashion of ‘Northern Soul’, which helped to create a broader appeal. Joining Culture Club on their tour, Platinum Blonde is back and just released their newest album Now & Never. Platinum Blonde has four albums that have collectively gone Platinum seven times over and garnered multiple Juno Award nominations, along with an induction into the Music and Broadcast Industry Hall of Fame. Across time, the one constant of Platinum Blonde has always been an unquenchable yen to evolve. With Now & Never, the band that’s made a career of forging its own path continues to roam free.